I love making cards using different kinds of folds and these easel type cards just make me happy! Today I am participating in 2 challenges - One Stop Craft Challenge (easel) and Saturday Challenge (1 IMAGE, 2 DESIGN PAPERS, 3 FLOWERS, 4 BRADS, 5 GEMS OR PEARLS). For my easel card I used more of that beautiful, however discontinued Greenhouse Gala dsp from Stampin' Up! 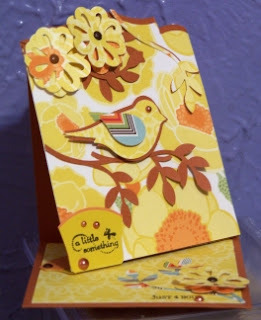 I also played with the Bird Builder punch, Triple Blossom Flower and Round Tab Punch. I think I was punch happy! LOL The sentiment is from Hodgepodge Happiness. Enjoy! Don't forget to check out my Holiday Mini Kits HERE! Lovely easel card! Thank you for joining us at OSCC! Betty I love the easel card the colors are beautiful. Fabulous card - so cheerful! I love the gorgeous colours of this fab card. The bird is so sweet. It looks fab. Thanks for joining us at Secret Crafters this week.